I have been going to Bob’s Deli for quite some time; I was first introduced to this place about 10 yrs ago when I worked right down the street. We often would go here on our lunches because it was quick, great prices & delicious food. And about 3 yrs ago my current job moved into this area of town and we have been using them for in office lunches for the whole team or just for a needed break away and they have never let me down with their quality and service. They are a family run business and that really shows in their service and food. They know their customers by name and always make people feel welcome. It is a small place inside of an industrial business park off the beaten path, and truthfully you could easily miss it if you aren’t looking for it. Since I have been eating here for years there are too many items that I can talk about but I am only going to focus on my last visit here and what we got. I went here on my lunch break because I was craving their cabo pockets, which is of course what I ordered. The cabo pockets have got to be the most basic thing but are just crazy good, they only make a select amount a day so when they sell out they sell out, and honestly there are some days where they just don’t make them at all. I often have to make sure I have a backup just in case, because of course I have gotten there just a little too late and could not get my fix. The cabo pockets are 3 tortillas that are stuffed with cheese and a piece of chicken, it isn’t shredded or cubed like most places an actual piece of chicken breast. I assume this is marinated in some kind of lime and seasoning, but I do not know for sure, but the chicken often has this fresh lime taste to it. The tortillas are then put on the flat griddle and toasted up a bit to melt the cheese. But the crowning jewel to this meal is the cabo sauce; which comes on the side. 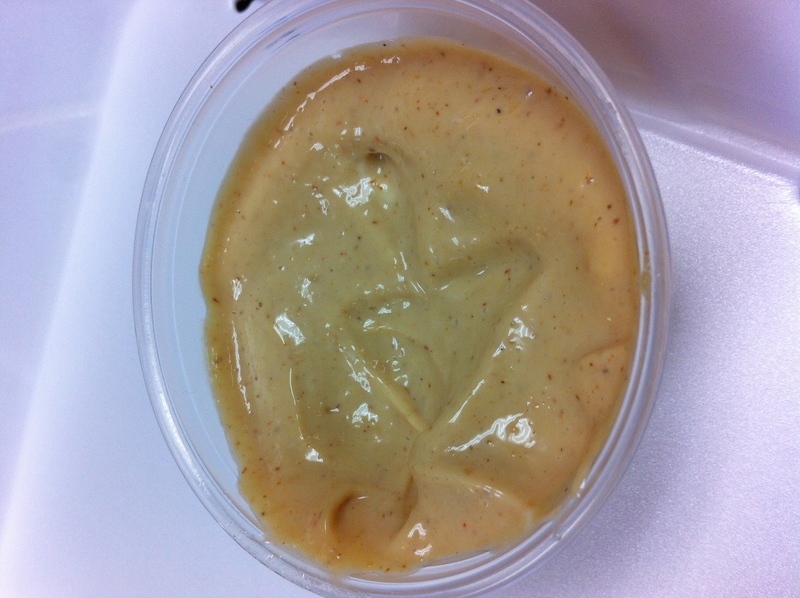 And I have found out recently is a mix of mayo and chipotle sauce; I love this sauce so much I was trying to make it at home and I can not come close to getting the same sauce. 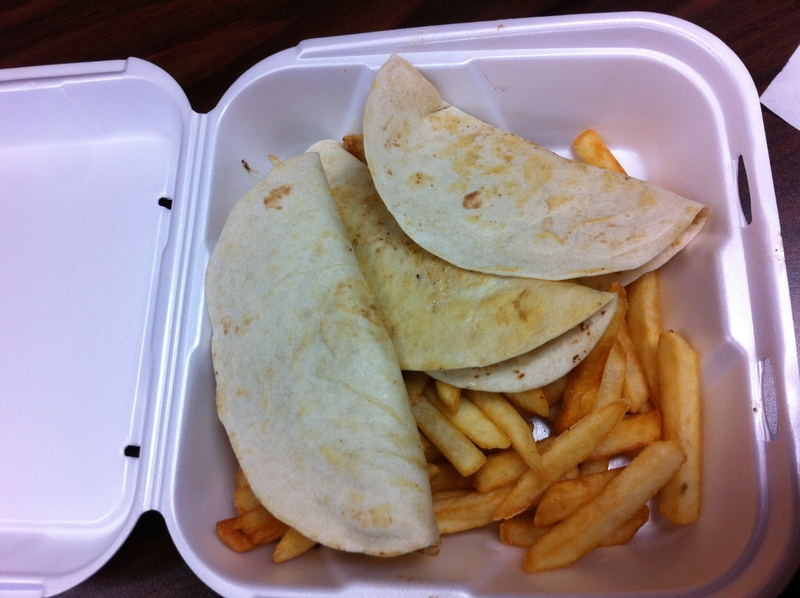 Also with each order you get a side a fries, and you get all of this for $7. There is something to be said for a dish that is so simple but has all these components that meld so well together, the melted cheese, perfectly cooked tender chicken & then you add the cabo sauce it is just one perfect bite. To me this is one of the best things on their menu and if you go there you need to get it at least once. My mother ordered her favorite thing on the menu which is their veggie sub and added American cheese. 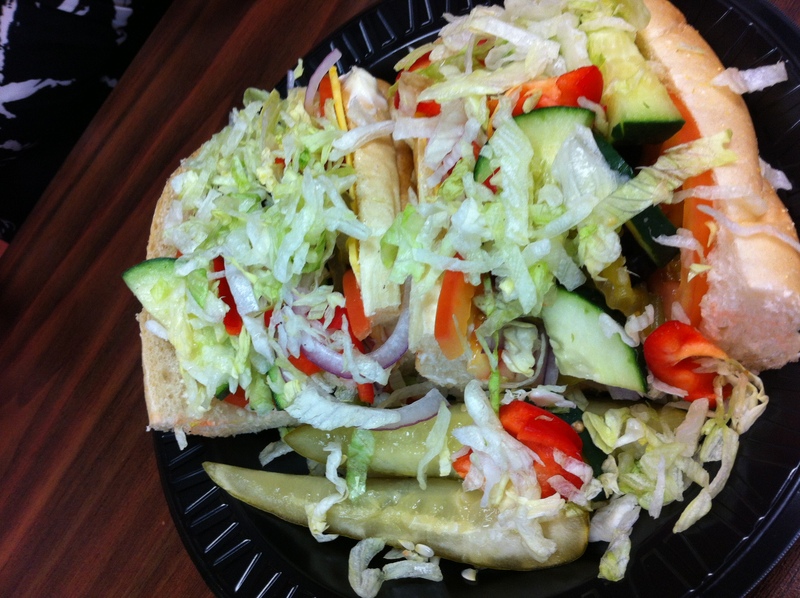 The veggie sub comes with a mixture of cucumbers, red bell peppers, lettuce, olives, tomatoes & onions on a sub roll. You can add cheese if you prefer which she does. We always joke that it is a salad with some bread, because you end up needing a fork to finish it off. As you can see from the picture they are quite generous with their portions, so you are truly getting your monies worth when eating here, this sandwich is $6.79. The ingredients are always fresh and just work so well together. I would highly recommend this place to anyone who is looking for a great local lunch spot, like I said this is just a snippet of what you can get here. The bob’s favorite & toll’s creation are two of my favorite sandwiches, they have such a large menu that you really can’t go wrong with anything. My mother likes the egg salad sandwich and the grilled ham & cheese. Oh and their soda sizes are not for wimps when they say large it is large which is great if you want to take a soda back to the office that will last you through the afternoon. Be sure to check them out if your in their neck of the woods you won’t be disappointed.